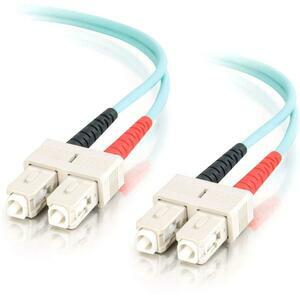 Get blazing-fast 10-Gigabit performance with laser-optimized 50/125 multimode fiber patch cords from Cables To Go. Laser-optimized multimode fiber (LOMMF) cables provide backward compatibility with existing 50/125 equipment while providing the performance headroom required to support laser light sources and 10-Gigabit applications. PRODUCT FEATURES: Fully compatible with 50/125 multimode fiber applications; Use with both LED and VCSEL laser light sources; Designed for use in 10-Gigabit ethernet applications; Lifetime warranty against defects of materials and workmanship.